What is Emergency First Response (EFR)? Who should take an Emergency First Response Course? This course is designed for anyone who wants to learn or update CPR and First Aid skills. During the Emergency First Response program you will also receive training for Automated External Defibrillators (AED). While this course is not diving specific, it meets PADI requirements for the PADI Rescue Diver and Divemaster certifications. 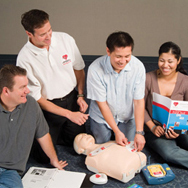 We also offer EFR Instructor classes. EFR student manual is included and yours to keep. Course Fee: $69.00 - includes all required materials. Read the Emergency First Response (EFR) participant manual and complete the knowledge reviews at the end of the Primary and Secondary Care sections.